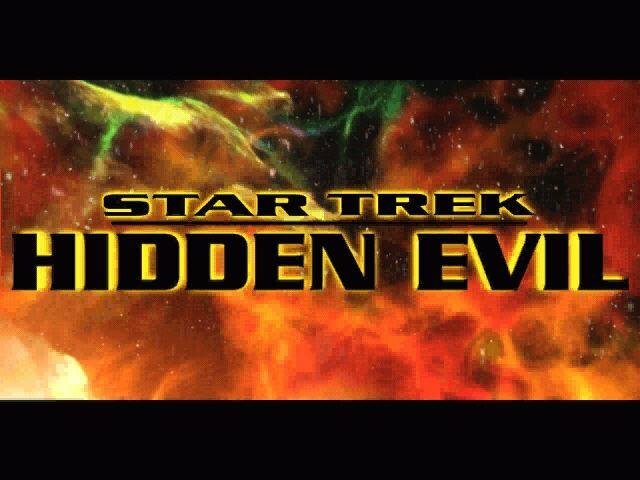 Star Trek: Hidden Evil is not the groundbreaking, must-have Trek game it was originally hyped to be. 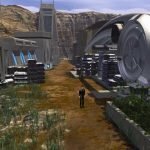 Despite the lovely graphics, faithfully sampled sound effects and admirable recreation of the Star Trek universe, the mixture of action and adventure just didn’t mix well. 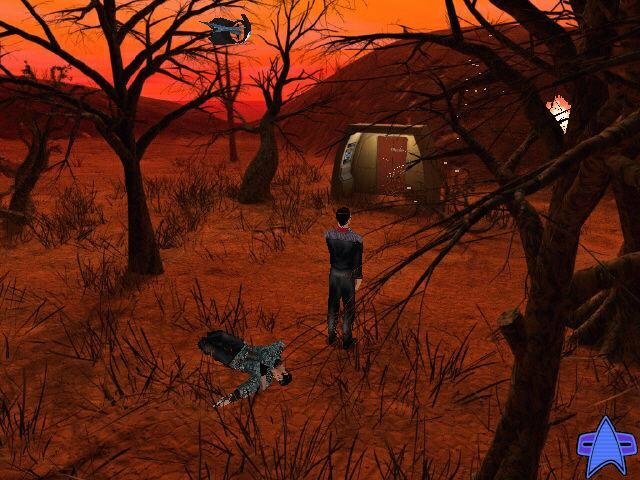 As it stands, it’s a third-person adventure game that doesn’t quite know where it stands. 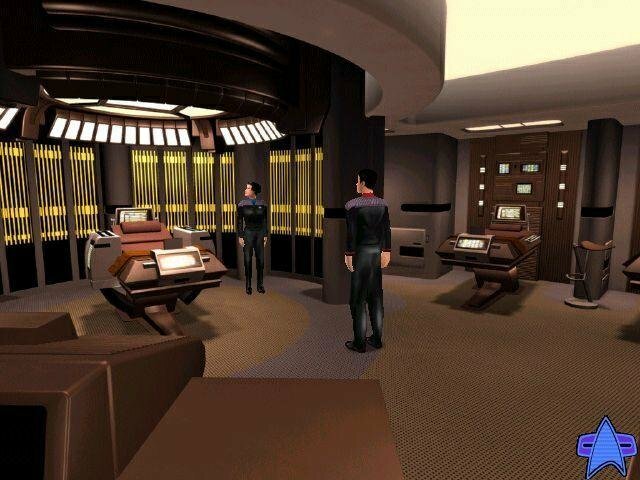 The game takes place nine months after the events depicted in Star Trek: Insurrection. 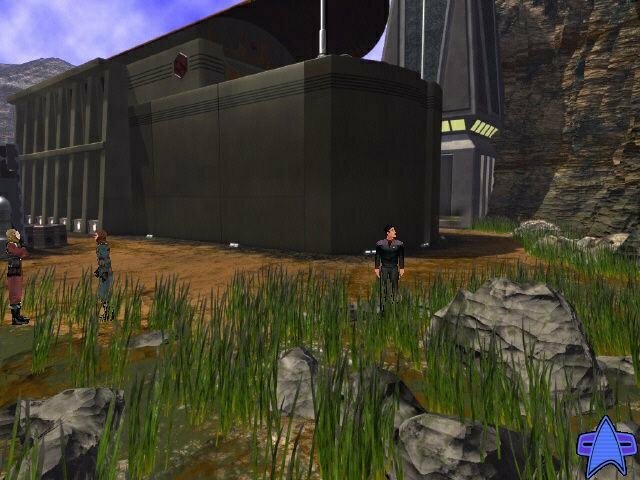 The expatriate Son’a have returned to the Ba’ku planet, source of a mysterious life-restoring energy, with the intent of building a colony. 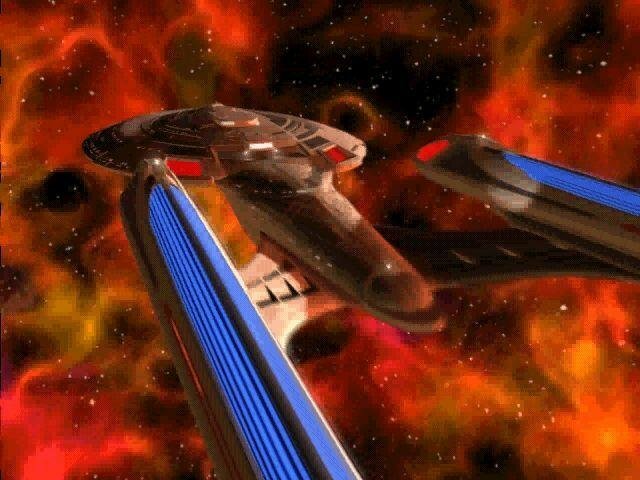 There they discover an ancient alien ruin, perhaps the origin of the energy field, leading the Ba’ku to summon Captain Picard and the Enterprise to excavate it. 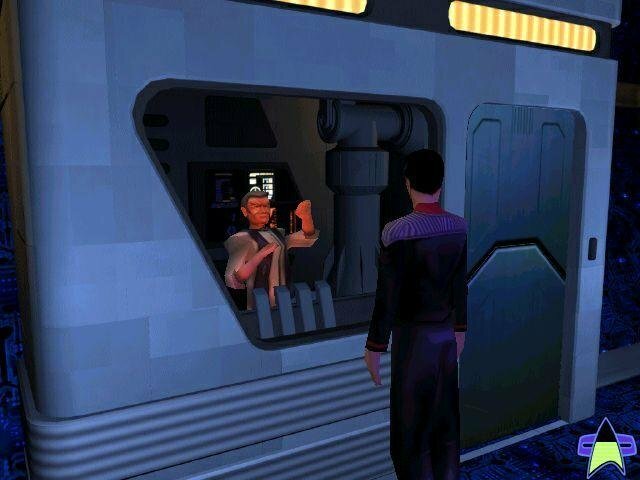 As Sovok, a human-raised-by-Vulcans ensign fresh from the Academy, you’re assigned to accompany Picard to Ba’ku, where you’ll meet up with Commander Data. Then things go wrong. 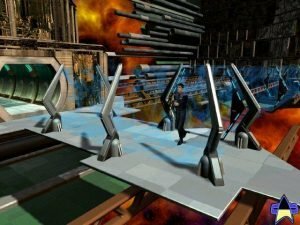 What ensues are nine interconnected missions which combine exploration, puzzle solving and phaser fights, each taking place in one of several primary locations: the surface of Ba’ku, inside the alien ruin, aboard a Romulan warbird, and, ultimately, aboard Enterprise. 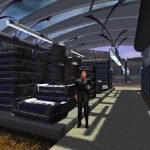 These locales are Hidden Evil’s high point: they’re beautifully rendered, as lush and crisp and colorful as in any adventure game. It’s hard not to be impressed by the quality of the artwork, even when running in software mode. 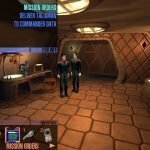 Missions are pretty standard fare. 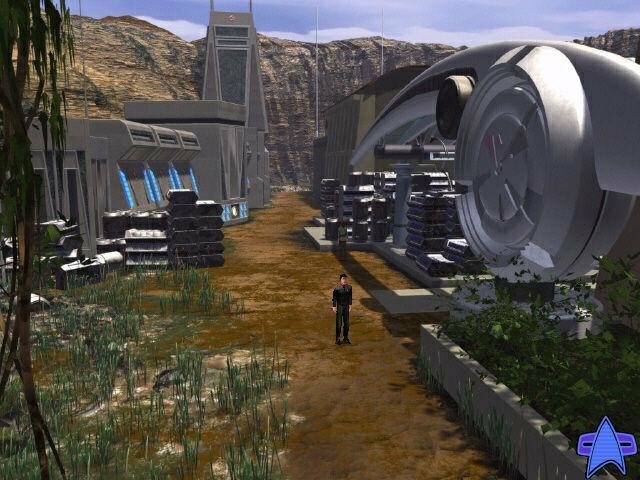 In the first, you must move from the Son’a colony down into the ruin, where Captain Picard will give you an artifact to return to Data for analysis. 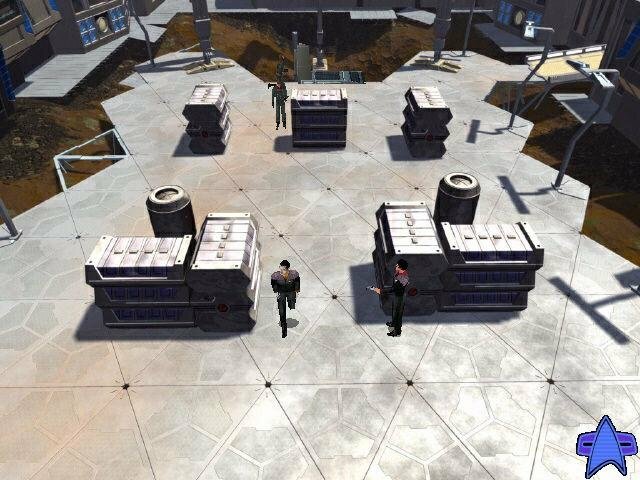 This gives you a good chance to explore the colony and get a sense of the game’s feel. 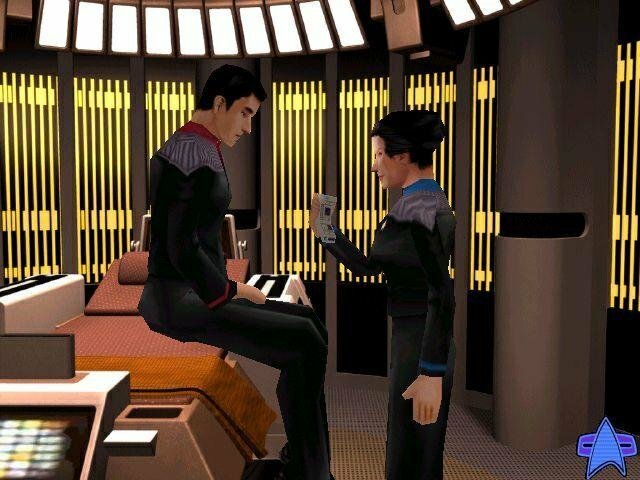 But, ultimately, all Data does is run a tricorder over the artifact — couldn’t Picard have done that? 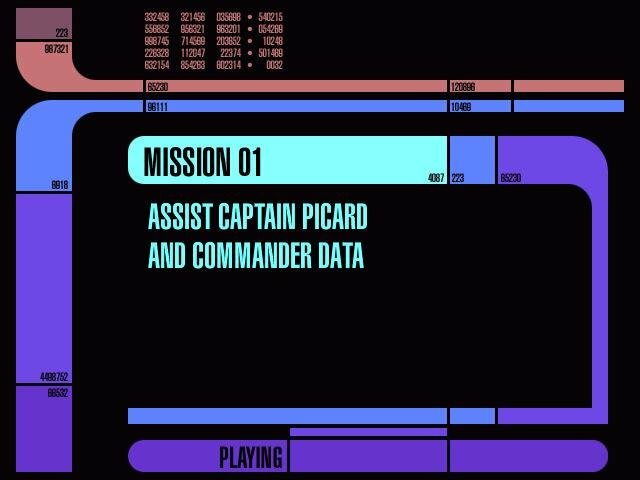 Later, Picard disappears from the ruin, so you and Data go looking for him. 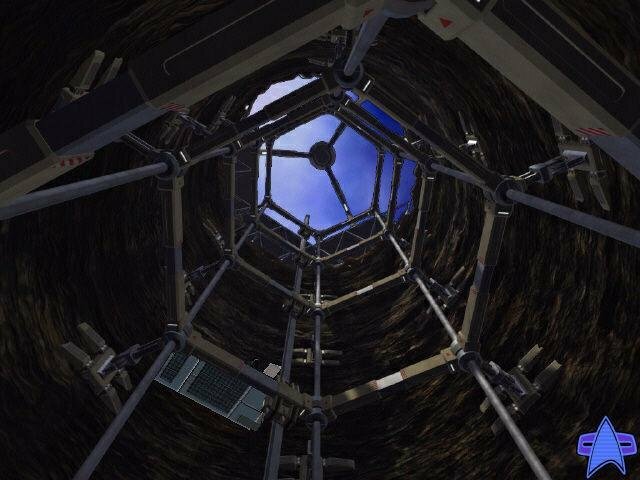 Soon you encounter the game’s first puzzle. 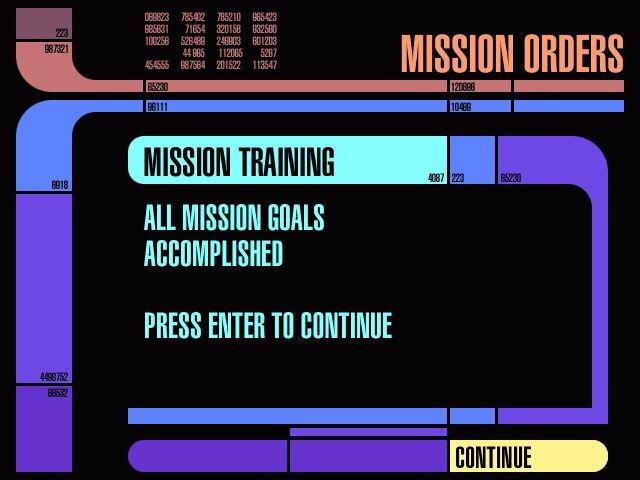 You must fit the correct pieces into a lock, in the correct order, to activate an alien transporter. 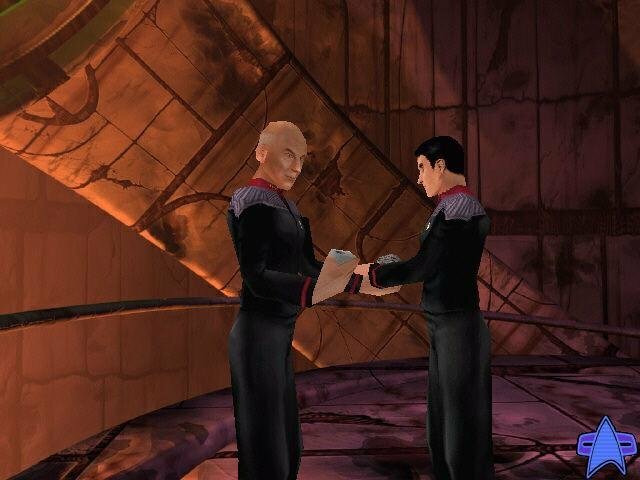 Despite the early interaction with Picard and Data, both in person and via communicator, Sovok pretty much works alone. 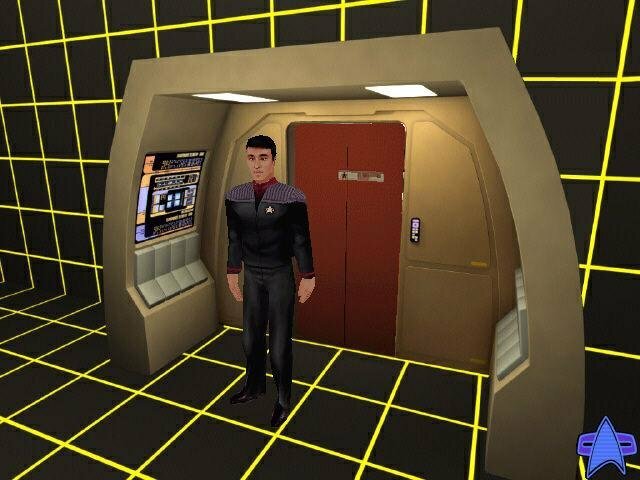 What’s more, your interaction with Picard and Data is extremely minimal. 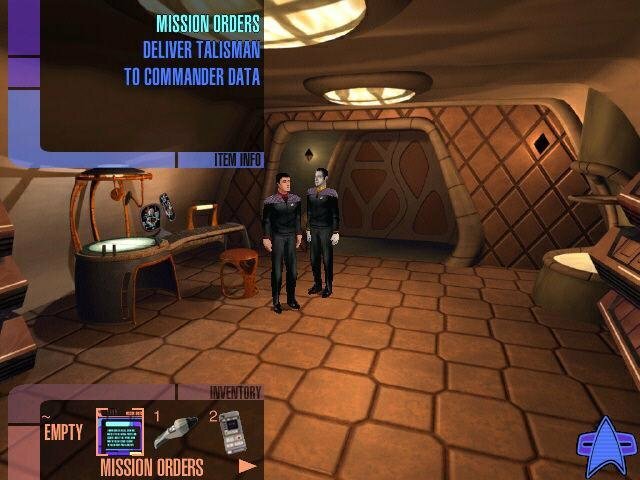 Data just plain disappears after the first few missions, and most of your conversations with Picard happen via communicator. Sovok is controlled entirely via the keyboard, as is the entire game. What’s worse, however, is that you can’t remap the keys; you’re stuck with the layout chosen by Presto Studios. Of course, it’s not as though you need a lot of keys to control Sovok. He doesn’t jump or crouch, and while he can strafe from side to side, he can’t do so while running. Hidden Evil uses a kind of auto-aiming system that displays a reticle on the target once Sovok is more or less facing it. Assuming you fire while the reticle is visible, you’re virtually guaranteed a hit. 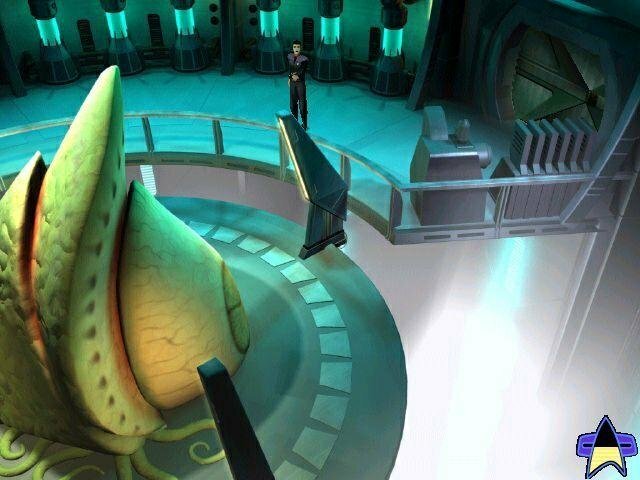 In the first couple of missions, one hit is usually all it takes to drop a Son’a or one of the creatures inside the alien ruin. Later you’ll need two or three accurate shots to score a kill. Despite the clunky controls, the truth is that the game isn’t all that difficult. For example, you can save whenever you want, so getting past difficult spots can be done quite quickly. 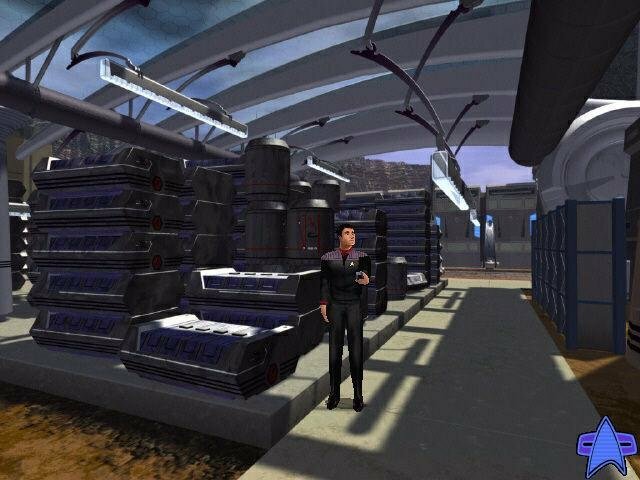 A game like this would have benefited dramatically from save “stations,” accessible only at one or two spots within each mission. It still manages to be fun, and most of the time it is beautiful and nicely cinematic. But the row of odd design decisions can’t begin to help it. 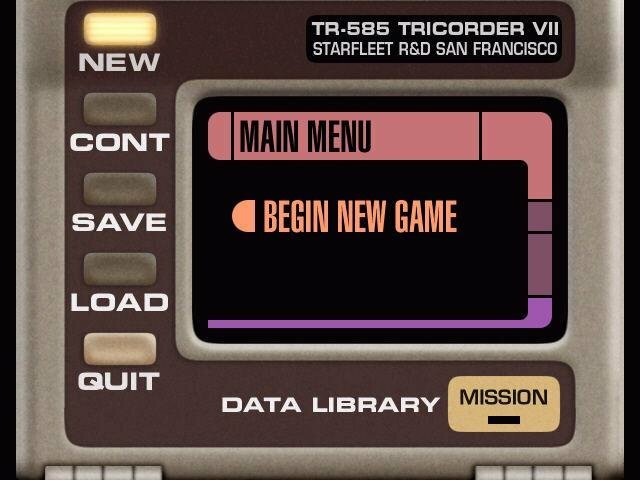 It’s ultimately not a great Star Trek game, but merely an average one.